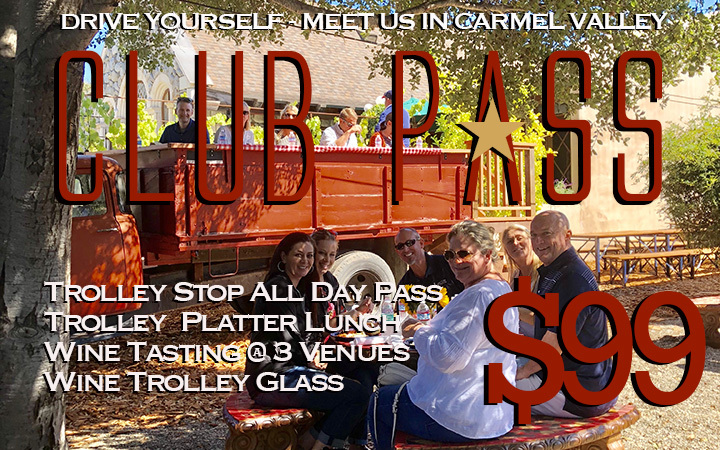 OUR NEW VENUE...OUR NEW "CLUB PASS"
Join us at the "Trolley Stop", 6 Village Drive, Carmel Valley Village with free parking for the day. Pick up your "Tasting Tokens" and let us guide you off into the village. You'll have many opportunities for tasting the region's finest wines. Your choices include: Cholone Tasting Experience, Windy Oaks Winery, Chesebro Wines, Rexford Winery, Parsonage Vineyards, Joyce Vineyards, Bernardus Winery, Boekenoogen Winery, Rombi Estate Wines, Joullian Vineyards, Testarossa Winery (except Saturday & Sunday), Idle Hour, Twisted Roots and Big Sur Winery. Come back to the Trolley Stop between 12:00 to 3:00 to enjoy your Trolley Platter Lunch and maybe to sip one of your recent purchases. Then off into the village again! You are responsible for safe and secure transportation to and from the Trolley Stop. No cancellations accepted on our tours. SERVICE fees at a rate of 4% will be added to all credit card orders processed over the phone. 15% Gratuity added to all parties of 10 or more. No food, ice chests or coolers are permitted on our vehicles or at the Trolley Stop other than the foods provided by Tours Monterey. Not all wine tasting rooms are open 7 days a week. We reserve the right to refuse service to anyone. Please no one under 21.